How much does gauge vary between knitters? I decided to experiment with my knitting friends to find out. I imagined that there would be differences—but I was shocked by how much! I asked twelve of my experienced knitter friends to knit swatches with the same number of stitches and same number of rows. 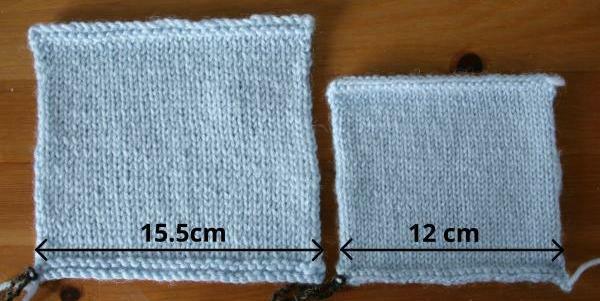 I then measured the squares and calculated the stitch and row gauge for each knitter. To try to eliminate any differences other than the knitters themselves, I made sure everyone used the same yarn and exactly the same needles. 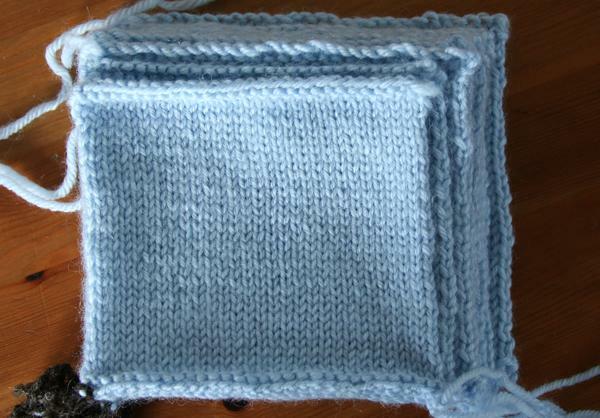 When each person finished their square, they passed the needles and remaining yarn onto the next person. I asked everyone to knit as they would normally knit. I also decided to make it anonymous, so that the knitters didn't feel like they were competing in any way. I collected all the squares at the end without any idea who knitted what. The swatches were made using DROPS Karisma, with all balls from the same dye lot. It has a stated gauge of 21 sts and 28 rows per 10cm, using 4mm needles. The needles were 4mm (US6) Knit Pro Symfonie Wood interchangeable circulars. The range equates to five dress sizes! I guessed there would be a range of gauges, but I didn't expect to see such a huge difference in size between the largest and smallest! The loosest gauge was about 10% larger than the manufacturer's stated gauge. To put this in context, this would result in a garment nearly two dress sizes bigger than intended. The tightest gauge was an incredible 20% smaller than the stated gauge. This would result in a garment more than three dress sizes smaller than intended. The difference in gauge also had a significant effect on the look and feel of the fabric. The largest swatch was airy and floppy, while the smallest was firm and dense. They would make for two very different sweaters. Only one swatch hit the stated stitch and row gauge exactly, though just over half of the swatches were within half a stitch of the stitch gauge, which is less than one dress size difference. 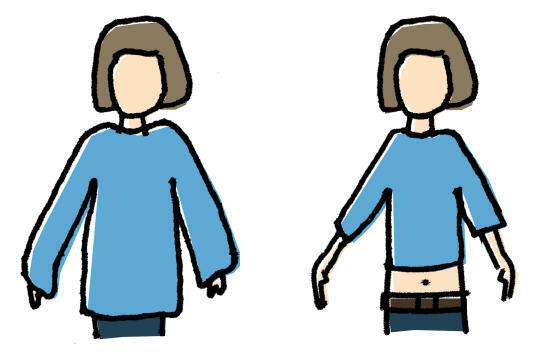 How the range in gauge might affect sweater size! If you want a garment to fit, swatching is crucial. Although some projects, such as scarfs or blankets, can often tolerate differences in gauge, for many garments it's essential to get the correct gauge, or very close to it, if you want them to fit. Designers suggest a needle size in a pattern as a starting point, not a gauge guarantee. As Clara Parkes says on her Cormo 3.0 yarn label, "Start your swatching on a US 10 [6mm] and see where it gets you." The difference between your gauge and a designer's gauge might be enough to make you several dress sizes out. It's too risky to make the assumption that using the recommended needle size is good enough. If you want your garment to fit and drape like the original, it's vital to check your gauge. If you're still wavering, think of a swatch as a chance to practice the stitch pattern of your design and to find out early whether you like working with the yarn, without needing to cast on hundreds of stitches! Thank you to the girls in my knitting group for giving me the gift of their knitting time, even though they were convinced that I just needed a baby blanket quickly! The same thanks to Anna at Wild and Woolly, my local yarn store (I couldn't ask for a better one). Anna also roped in Amelia Hodsdon (aka Woollen Words) to knit a square for me - thank you. Thanks also to Webs and Knit Picks, who answered all my questions about gauge.